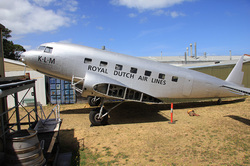 The Douglas DC-2 holds an important place in world and Australian aviation history with its success in the 1934 England to Australia Air Race. Operating as a scheduled KLM airline service, with passengers and airmail, a DC-2 PH-AJU "Uiver" placed outright second behind a purpose built DH Comet racer, and first on handicap, bringing to a close the use of timber and bi-plane designs in commercial air transport. The DC-2 was developed from a 1932 TWA Airlines requirement for a replacement for its aging wooden airliners due to the cost of operations and maintenance. TWA’s competitor, United Airlines had ordered Boeing’s 247 Airliner, and locked up production for others until their own needs were met, risking a significant competitive disadvantage to TWA. Douglas, who had previously only built military aircraft, were keen to secure work for the airlines and responded with the twin engined DC-1, The DC-1 had a design cruise speed of 190 MPH, 30 MPH faster than the Boeing 247 (20% faster), and could carry 14 passengers compared to 10 in the Boeing 247 (40% more load). As TWA was currently operating trimotor airliners to ensure added safety they demanded demonstration of the DC-1 on single engined performance. A novel demonstration on September 1933 saw the DC-1 depart Arizona's Wimslow airport and cut one engine immediately on takeoff, climb to 8000 feet and cruise to Albuquerque on one engine, arriving there 15 minutes ahead of the TWA Ford Trimotor scheduled flight that had departed Wimslow before it. TWA immediately ordered twenty DC-2 aircraft which incorporated minor changes to the DC-1 Prototype, and by the end of 1934 all but one of the major US airlines had the DC-2 on order or in service, and Boeing was unable to sell any further Boeing 247 Aircraft. A total of 198 DC-2 and its military C-33 & C-39 versions were built before it evolved into the larger "sleeper" DST and DC-3 design as the worlds' most successful commercial airliner. Four DC-2's saw service with Holyman's and Australian National Airways in Australia prior to World War 2, and were the first aircraft in Australia to be crewed by air hostesses. A total of 20 served in Australia including three ex-KNILM DC-2 aircraft evacuated from the Japanese invasion of the Dutch East Indies, and three USAAC C-39 transports used by the 5th Air Force in Australia and New Guinea.. The Museum's aircraft was the 32nd DC-2 to be constructed,and with registration as NC13782 was one of the first ten DC-2's purchased by American WW1 ace Eddie Rickenbacker in October 1934 to create his famous "Great Silver Fleet" at Eastern Airlines in the USA. 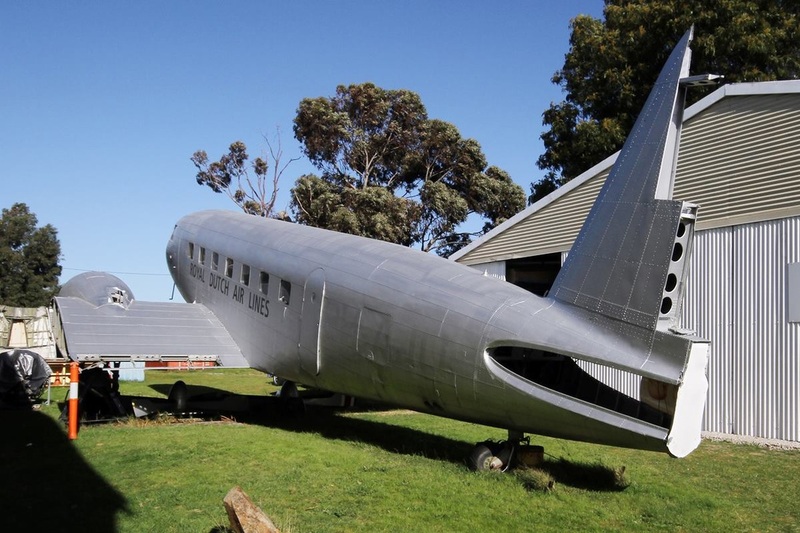 Replaced by DC-3's in Eastern Airlines service, NC13782 and the other 9 DC-2's were sold to the British Purchasing Commission in 1940, and shipped to Australia to join the RAAF as its first true transport aircraft. With the RAAF number assigned as A30-9, it was initially used in various units including 1 Wireless Air Gunnery School, 2 and 3 WAGS, and the Signal School at Point Cook, but the entry of Japan into the war in December 1941 and the need for dedicated transport squadrons saw the creation of 36 Squadron in March 1942. This squadron used up to 7 DC-2 aircraft including A30-9 until the arrival of three C-43 and two C-50 aircraft on loan from the USAAF in mid 1943 (including our own DC-3 as C-50, VHCDJ) saw many of the DC-2's transferred to other duties. A30-9 carried the call sign VHCRK (not a civil registration) during its service with 36 Squadron and later served with the Paratroop Training Unit on attachment from 36 Squadron until 1945. The aircraft was disposed to the CSIRO via free issue from the RAAF in 1946, and later became a source of spares for the post war DC-2 operator Marshall Airways. Restoration to airworthy status commenced in the late 1980's by a private syndicate, however, corrosion found in the centre-section left the aircraft permanently grounded. In early 2005 the owners donated the aircraft to the Museum under the Cultural Gift Program. This aircraft is one of eight DC-2's remaining in the world, and today A30-9 is the third oldest Douglas Commercial airliner in existence.